A ‘Live International Live Global Simulcast Marriage Seminar’ will be held on Friday, February 8th and Saturday, February 9th. 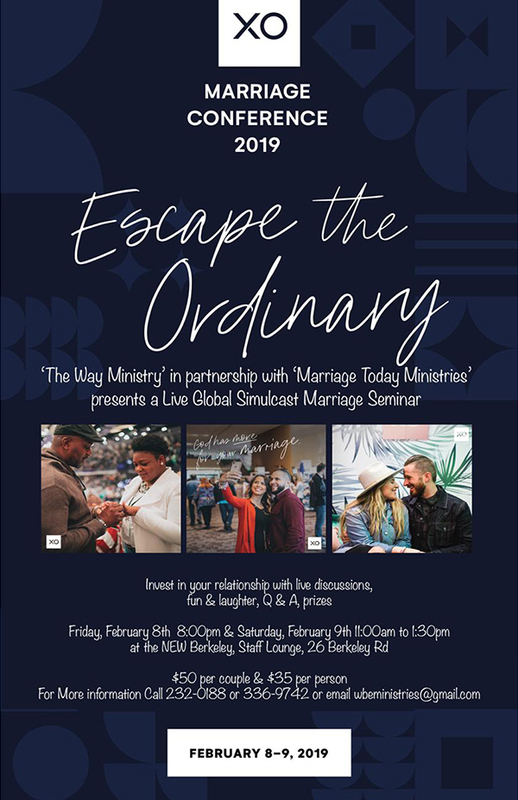 A spokesperson said, ”’The Way Ministry BDA’ in partnership with ‘Marriage Today Ministries’ presents ‘Escape the Ordinary’ a live Global Simulcast Marriage Seminar. “Just in time for Valentine’s Day, Escape the Ordinary will explore real life relationship issues and share tools to navigate and improve relationships whether you are newly married or have been married for 25 years. The event is open to those who are married, those who intend to be married and singles who want to know about marriage. “Invest in your relationship with live presentations and discussions, fun & laughter, prizes and refreshments. “With Valentine’s Day right around the corner, there is a feeling of love and what people perceive love to be in the atmosphere. The Way Ministry BDA will host this seminar in hopes that we can help couples and single men and women truly understand the meaning of love, what it looks like, feels like and how to have a healthy relationship. “Marriage is work, but with understanding, tools and maintenance gained through open discussions, Q&A partnered with the live simulcast, we intend to help the attendees to escape the ordinary and walk away with better relationship building skills to move in a positive direction,” said Pastor Wayne Butterfield. “Tickets for the entire seminar are $50 per couple & $35 per person. Tickets are available at The Music Box or can be purchased at the door. “wBe Ministries was founded in June 2015 by Pastor Wayne and Elaine Butterfield as a resource for strengthening Marriage and Families through facilitated teachings, group studies and fellowship.